Ready to ramble? 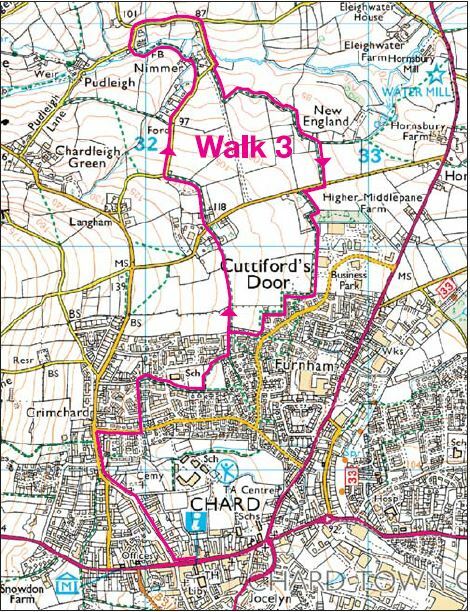 There are collections of walks around Chard, Hemyock, Stockland and Upottery, walks in the north eastern and south western Blackdown Hills. For guided walks take a look in our events calendar. Please note: not all of our walks are listed on our new website yet, but we'll be adding more very soon! An easy-to-follow walk through some attractive and interesting countryside. There is one hill to climb, but the subsequent view is outstanding. The route starts from the nature reserve car park at the end of Oaklands Road. A constantly undulating walk through typical Blackdown Hills scenery. 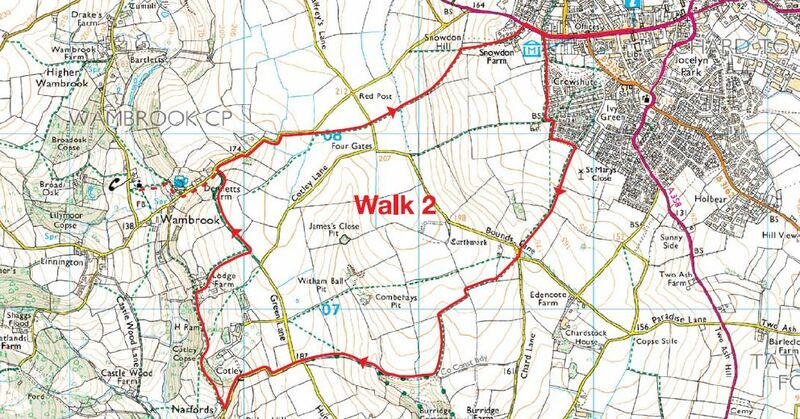 Most of the route is on footpaths and bridalways, with small sections of quiet lanes. This route is fairly flat throughout and features a pleasant combination of town and country. 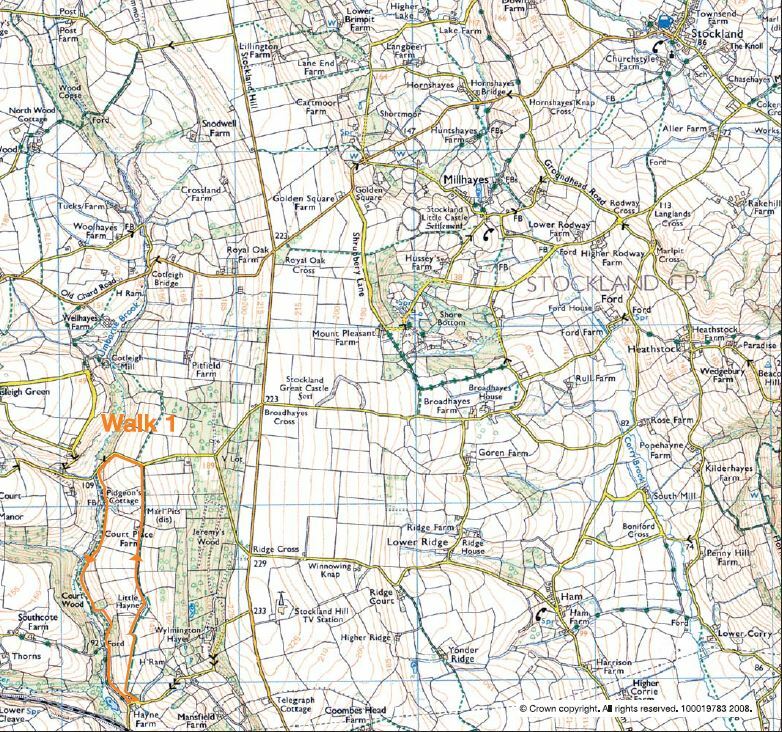 This triangular route, is reasonably demanding, but rewards the walker from start to finish with a range of delightful scenery and some superb wide views. Starts and ends at Combe St Nicholas. Please do not be put off by the length of this walk. It is an absolute pleasure, combining many footpaths and quiet lanes. The scenery and surroundings are attractive throughout and the hilly sections are not too demanding. The route is described from the starting point of Chard Museum. 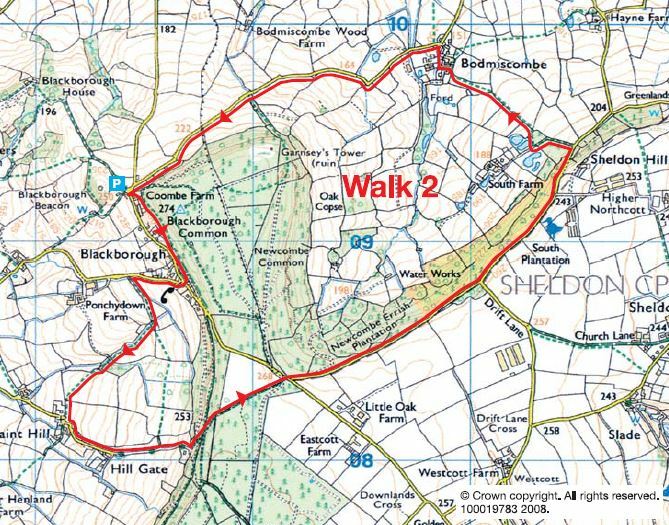 The walk to Chardstock is delightful and contains a wide variety of scenery. The return, on quiet lanes, provides good views in all directions. The route is described from the starting point of St Mary’s Church, Chard. 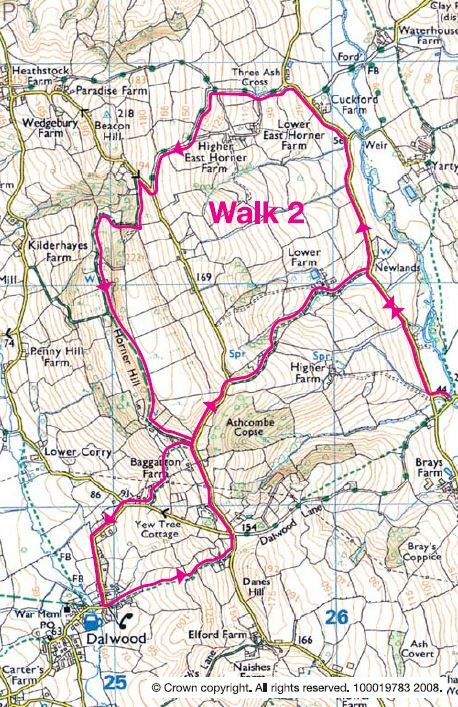 Starting from Millhayes as described, this walk is about 11km (7 miles) long. 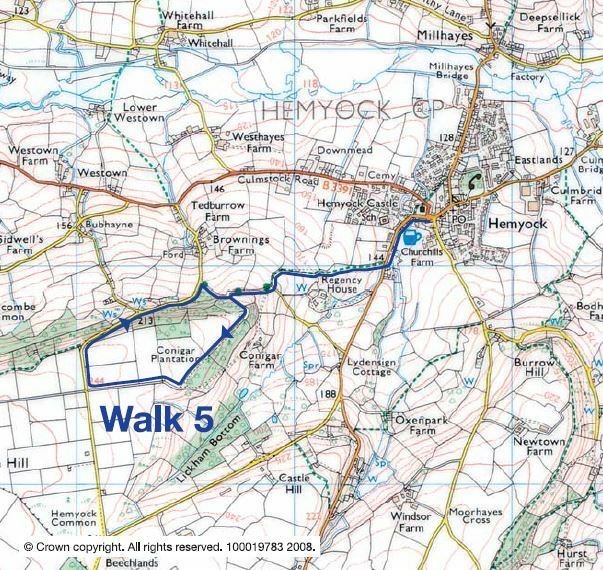 The walk is from the edge of Hemyock, through Culm Davey and Blackdown Common, on to Culmstock Beacon and back. 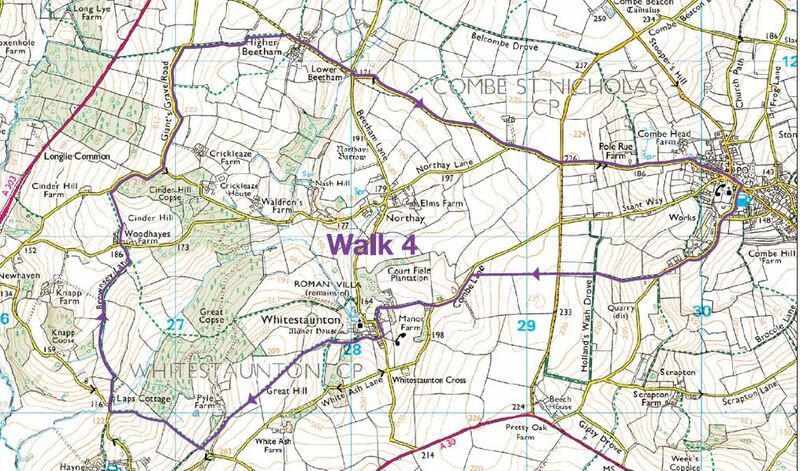 The best part of the walk is from Whitehall; if you start from here, the walk is just over 7km (4.5 miles). There is a place to park cars on Withy Lane about 0.5km west of Whitehall. A strenuous 9km (5.5 mile) walk, well rewarded with lovely views of the Culm Valley looking west and spectacular views of the Quantocks and beyond from the Wellington Monument. 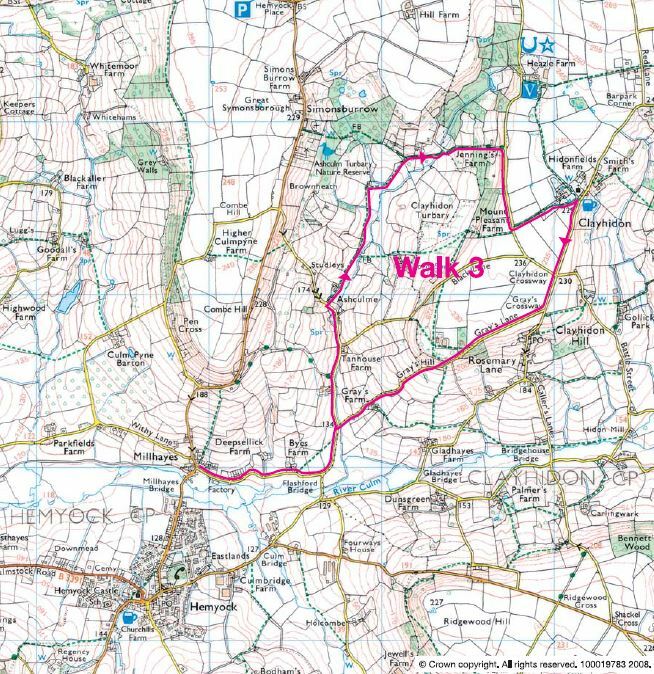 A fairly gentle 7.5 km (4.5 mile) walk along quiet lanes and tracks, with an opportunity to visit a nature reserve and a pub. 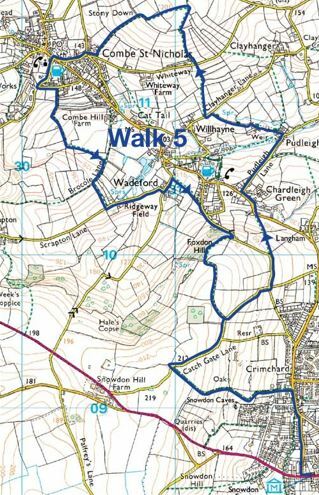 A 6.5 km (4 mile) walk with lovely views of the secluded Madford Valley and a visit to the ruins of a Cistercian abbey. 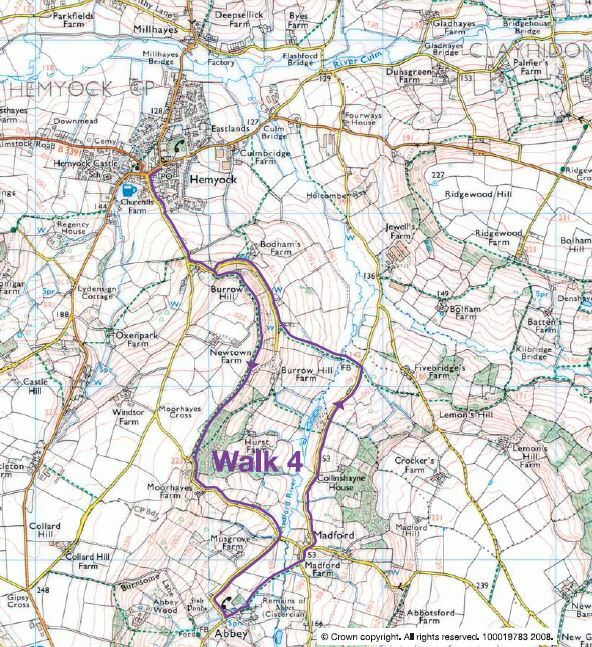 A gentle 4.5 km (3 mile) walk crossing several braids of the river Culm. 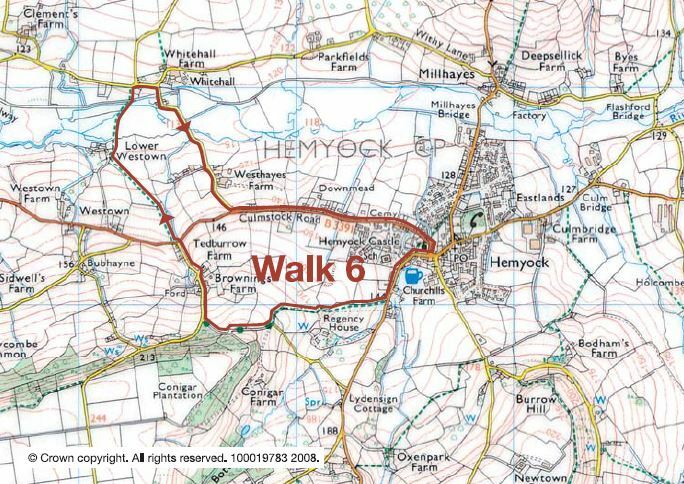 This walk can be linked to the Hemyock to Owleycombe route (walk 5). Godford Cross to a place that belongs to Canada! 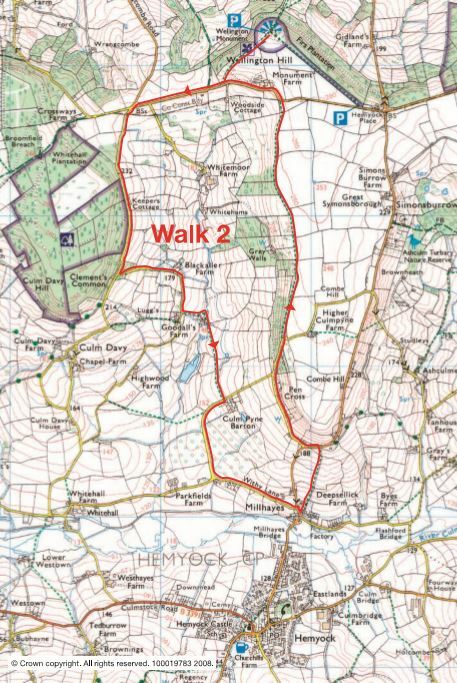 This walk starts in a lovely valley road and climbs into the hills, before returning on a scenic bridle path. Enjoy delightful views across to Hembury Hillfort and you can pay a visit to Wolford Chapel along the way. Wolford Chapel, burial place of John Graves Simcoe, first Lieutenant Governor of Upper Canada, was donated to the people of Ontario in 1966. Within the Chapel there area fine examples of Jacobean workmanship. Park just off the A373 at Godford cross, just west of Awliscombe. A superb walk with magnificent views and the special atmosphere of this picturesque village. Starts with a climb, then a flat section and finally a good downhill stretch. 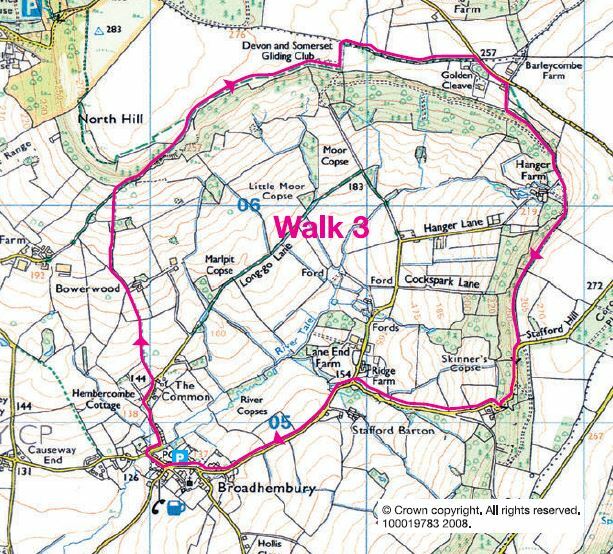 A superb walk with magnificent views and the special atmosphere of the picturesque village of Broadhembury. Starts with a climb, then a flat section and finally a good downhill stretch. Broadhembury is a well-preserved medieval estate village dating from the 13th century, although most of the existing houses date from the late 16th and early 17th centuries. The village has changed very little over the centuries. St Andrews, Broadhembury’s parish church, was consecrated in 1259. It has a tower dating from 1480. Church Gate is probably the oldest house. In is time it served as the priest’s house, a poor house, a reading room and a schoolroom. There is also an Art Nouveau house, opposite the church, which was built at the turn of the 20th century. 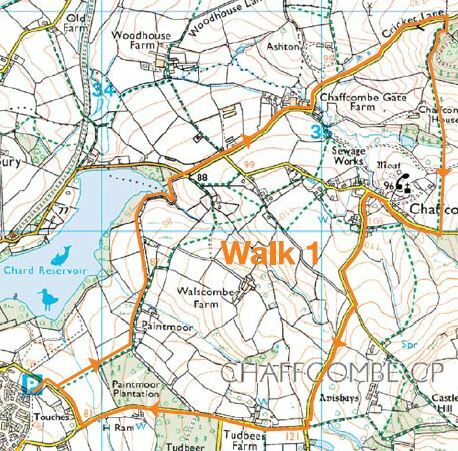 The walk will take you from Broadhembury up North Hill to the Devon and Somerset Gliding Club field, with a chance to enjoy views across to Hembury Hillfort and back towards the village. Refreshments are available at The Drewe Arms and the local shop and tea room in the old vicarage. Parking in the village centre. 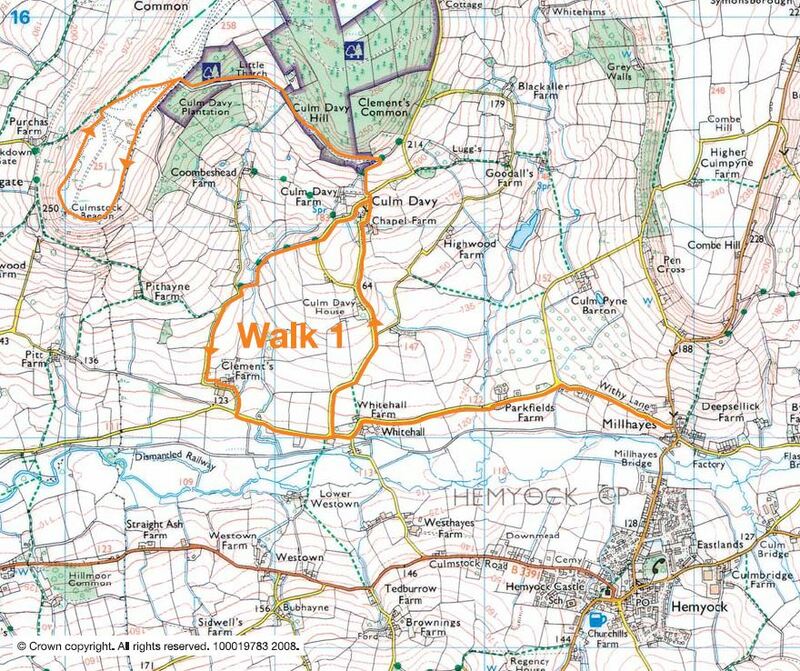 This walk takes you from the westerly edge of Stockland parish, along the old Devon-Dorset border. Enjoy delightful sheltered woodland and a fast-flowing stream. The route is mostly flat, with some steps and stiles. Some short sections can be wet. 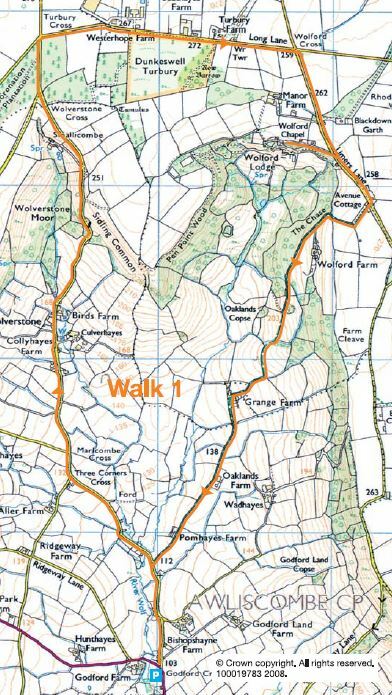 Access the walk from Broadhayes or Ridge Cross, off the Stockland Seven Mile Straight. There is some very limited parking near the start of the walk at the bottom of the hill. Alternatively park on the hill and walk down to the bridge.